Are you a Morning Person / Early Bird or an Evening Person / Night Owl? I found a great quiz to help you find out what time of day you are most alert and in prime condition for physical exercise: Real Simple Quiz. 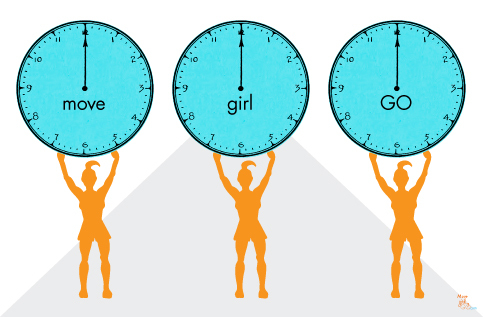 I scored exactly in the middle, which is predictable since I tend to exercise around the noon hour on most days. Usually I don’t get started until 11:30 AM, although I have been known to make myself get to the gym for a 9:30 AM class if I absolutely have to — but that’s a struggle for me! The lunch-hour classes suit me just fine! It is so much better to be working out rather than eating lunch. When I see the crowds of people hunting for places to eat and devouring food at noon-time, it always strikes me as a little odd that they haven’t opted to do a workout instead — what could be better than skipping the calories and instead burning some calories, followed by a quick snack on the way back to work. Definitely it’s important to do advance planning and scheduling of exercise. It took a long time before I developed a normal, habitual routine of exercising almost daily. It used to be that I studied the exercise class schedule every month, and highlighted the ones that interested me, and made that into my plan to get myself to the gym. But now it’s a matter of habit — I’ve got the days and times of my favorite classes burned into my brain. I’ve made myself into a regular attendee, so much so that I have the feeling that the teacher is counting on me, and if I don’t show up for a class or two, I’ll be missed. To me, that is a real motivator to show up — I don’t want to let anyone down, least of all myself.